A Christmas Gift for You: Gift Jars! » Uncategorized » A Christmas Gift for You: Gift Jars! With Christmas fast approaching we are readying ourselves for the gift giving season. We know that you have so much love to share, so many great intentions to show just how grateful you are for all the wonderful people in your lives. We also know that giving a thing doesn’t always match up with your eco values but maybe you don’t necessarily want to turn up empty handed. And so the Gift Jar was born! 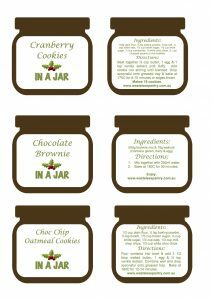 We have a range of jars available for order at the store but since we are more about sharing the zero waste love than we are about profiting from the commercialism and consumerism of Christmas, below is your own printable version of the gift jar labels that we are using in store this Christmas. So, if you want to make them on your own you now have what you need! And if you don’t have the time or just like the idea of us making them up for you, give us a call, an email or visit us to order at least 3 days in advance (up to 7 days as we get closer to Christmas).